Beijing Aerospace Command and Control Center (BACC) on Dec. 12, 2018. HELSINKI — China's Chang'e 4 lander and rover spacecraft successfully entered lunar orbit Wednesday (Dec. 12) following a four-and-a-half-day flight to the moon. The spacecraft entered an elliptical lunar polar orbit with a perilune of 62 miles (100 kilometers) at 3:45 a.m. EST (0845 GMT) Dec. 12 following a lunar orbit insertion burn. The China Lunar Exploration Project (CLEP) announced the success of the crucial braking maneuver within minutes and confirmed that the spacecraft was functioning well and will begin preparations for communications tests with a relay satellite and refining its orbit. Chang'e 4 was launched by a Long March 3B carrier rocket from the Xichang Satellite Launch Center, southwest China, at 1:23 p.m. EST (1823 GMT) on Dec. 7 for a 110-hour journey to the moon. Three trajectory correction maneuvers had been planned for the lunar transfer orbit phase, but just one, carried out Dec. 9, was required, with the first and final maneuvers deemed unnecessary and thus canceled. Consisting of a lander and a rover, the spacecraft will attempt the first-ever soft landing on the far side of the moon — which due to tidal locking never faces the Earth — in early 2019. The far side of the moon and distant Earth imaged by the Chang'e-5 T1 mission service module in 2014. The lander and rover are equipped with cameras and science payloads to analyze the lunar surface geology and subsurface, solar wind interactions and carry out low-frequency radio observations in the unique radio-quiet environment on the far side of the moon. Communications with the spacecraft will be facilitated by the 'Queqiao' relay satellite launched in May and subsequently inserted into a halo orbit around the second Earth-moon Lagrange point, some 40,000 to 53,000 miles (65,000 to 85,000 km) beyond the moon. The landing will target candidate landing sites in the South Pole-Aitken Basin (SPA), with the selected site understood, but not officially announced, to be the 116-mile-diameter (186 km) Von Kármán crater. The South Pole-Aitken Basin is a 1,550-mile-wide (2,500 km), 7.5-mile-deep (12 km) ancient impact crater of intense scientific interest which could contain exposed material from the moon's upper mantle and clues to the history and development of the moon. Head stated that the Visible and Near-Infrared Imaging Spectrometer (VNIS) payload is also of very high interest and will allow comparisons between the mineralogy of the floor of the South Pole-Aitken basin to nearside units and help answer questions such as, Did the South Pole-Aitken Basin impact penetrate to the lunar mantle? China's Yutu moon rover, photographed by the Chang'e 3 lander in December 2013. The lunar far-side mission, Chang'e 4, which launched on Dec. 7, 2018 and arrived in lunar orbit 4.5 days later, was designed as a backup for Chang'e 3. 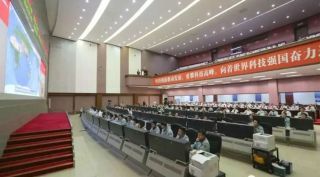 No official date has been released for the powered descent landing attempt, but the China Aerospace Science and Technology Corporation (CASC), the main contractor for the Chinese space program, indicated shortly after launch that the landing will take place in the first days of January 2019, following sunrise over the main candidate landing within the Von Kármán crater in late December. Chang'e 4 was originally planned as a backup to the Chang'e 3 lander and rover mission, which in December 2013 made China the third country to achieve a soft landing on the lunar surface, and the first since the Soviet Union's Luna 24 in 1976. The lander has a dry mass of 2,650 lbs. (1,200 kilograms) and carries the 310-lb. (140 kg) rover. At launch, when loaded with propellant, the spacecraft weighed around 8,380 lbs. (3,800 kg).